Black Boxes From Ethiopia Plane Crash Show Similarities With Indonesia Crash The announcement follows a mass funeral for the victims of last Sunday's Ethiopian Airlines plane crash. Relatives say they were offered soil from the site of the crash. 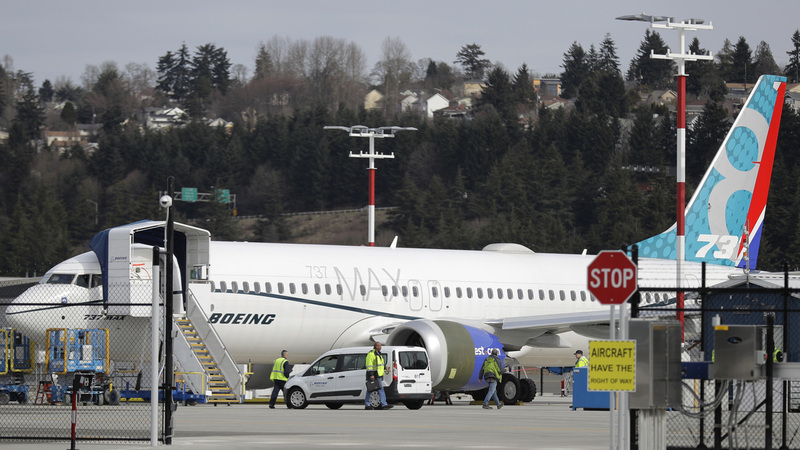 A Boeing 737 MAX 8 airplane pictured on Thursday in Seattle. Data retrieved from the black boxes of the Ethiopian Airlines crash that killed all 157 people on board last week show "clear" similarities with the crash of a Lion Air jet in Indonesia last October. Both crashes involved the same model of plane: the Boeing 737 Max 8. Ethiopian Transport Minister Dagmawit Moges, who announced the findings on Sunday, said the government would release more detailed information within a month. As Russell Lewis reported Sunday for NPR's All Things Considered, the similarities involve an anti-stall system on both jets, designed to push the nose of the plane down if flight control systems sense a problem with low air speed. Both the planes appeared to ascend and descend erratically, suggesting the pilots struggled to maintain control. "This is just one aspect of what's expected to be a long and really lengthy investigation that could take several years," said Lewis. "But it is another clue that seems to indicate that what brought down both jets seems to be related." "Aviation accidents are rarely the result of a single cause," Lewis noted. "There are often many small things that lead to a crash, and that's why these investigations take so long." Separately on Sunday, The Seattle Times reported that an analysis Boeing delivered to the Federal Aviation Administration regarding the safety of the plane's new flight control system, called MCAS [Maneuvering Characteristics Augmentation System], "had several crucial flaws." The safety report came as Boeing was rushing to catch up to its competitor Airbus in 2015. Anonymous sources inside the FAA told the Times that the agency inappropriately delegated the airplane's certification to Boeing employees. The company told the Times there were "significant mischaracterizations" in its description of flaws in the analysis. "The 737 MAX was certified in accordance with the identical FAA requirements and processes that have governed certification of all previous new airplanes and derivatives. The FAA considered the final configuration and operating parameters of MCAS during MAX certification, and concluded that it met all certification and regulatory requirements." Sunday's developments came after relatives of the victims of last week's crash gathered beside empty coffins at a mass funeral in Addis Ababa, Ethiopia. Family, friends and other mourners, some holding up photographs of loved ones who died in the crash, joined a funeral procession as the caskets were carried to Holy Trinity Cathedral. Priests swung incense over the caskets, which were draped in flags and adorned with pictures of the deceased. Relatives told news wires prior to the funeral that they were given small sacks of scorched earth from the site of the crash in place of remains, which are expected to take months to identify. Some relatives, including Muslim families, expressed frustration that they could not yet bury their dead, as dictated by their religious beliefs. "The soil came as it became impossible to identify bodies and hand over remains to family members," one family member told The Associated Press. "We will not rest until we are given the real body or body parts of our loved ones." Moges said at a news conference on Saturday that it could take up to six months to identify victims but that death certificates would be issued in a couple of weeks, AFP reported. She said the investigation into the crash of Flight 302 would take "considerable time." In a statement issued in response to Moges' announcement, Boeing's chairman, president, and CEO, Dennis Muilenburg, said safety was the company's "highest priority" and that the aerospace giant will work to assist the investigation. "While investigators continue to work to establish definitive conclusions, Boeing is finalizing its development of a previously-announced software update and pilot training revision that will address the MCAS flight control law's behavior in response to erroneous sensor inputs," Muilenburg said. The brand-new Boeing 737 Max 8 aircraft, which crashed shortly after takeoff from Addis Ababa, was carrying passengers and crew members from 35 countries, according to Ethiopian Airlines. Kenyan, Canadian, Ethiopian, Chinese, Italian and U.S. citizens were among those on board. Ethiopian Airlines employees held a memorial service for deceased colleagues and passengers on Friday. The crash came several months after Lion Air Flight 610 in Indonesia went down over the Java Sea, also just minutes after takeoff. In response to safety concerns over the Max 8, dozens of countries, including the U.S., moved this week to ground the aircraft. The FAA said in a statement on Wednesday that its temporary grounding order would remain in effect "pending further investigation, including examination of information from the aircraft's flight data recorders and cockpit voice recorders." Prior to Moges' announcement about the black box data, the FAA said that evidence from the site of the plane's impact, coupled with satellite data tracking the aircraft's flight path, showed similarities with the Lion Air incident. Boeing said in a statement that it continues to have "full confidence" in the plane's safety but that it was recommending temporarily suspending operations of the entire global fleet of the 737 Max aircraft, totaling 371 planes. The investigation into the cause of the crash continues in Ethiopia and France, where the country's air accident investigation authority has agreed to help handle the incident. French authorities said on Saturday that they were able to extract the data from the first black box, as NPR's David Welna reported. They turned the audio files from the cockpit voice recorder and data from the flight data recorder over to Ethiopian investigators, The Wall Street Journal reported.